As digitization continues to advance, so does the global awareness for preserving privacy. One clear path is the GDPR requirement to implement Privacy by Design (PbD) principles as part of Personally Identifying Information (PII) handling. The guiding rule is to view all PII elements and assess them in accordance to usage and duration; usage, means the data being used as intended and agreed. Duration refers to the agreed time length of usage. When discussing PII, our face is arguably the most fundamental and highly visible element of our identity and is therefore considered as a sensitive PII. As technology continues to advance, so does the risk to privacy from face recognition technologies that are being exploited by organizations and individuals to try and find information about a data subject, without prior consent. 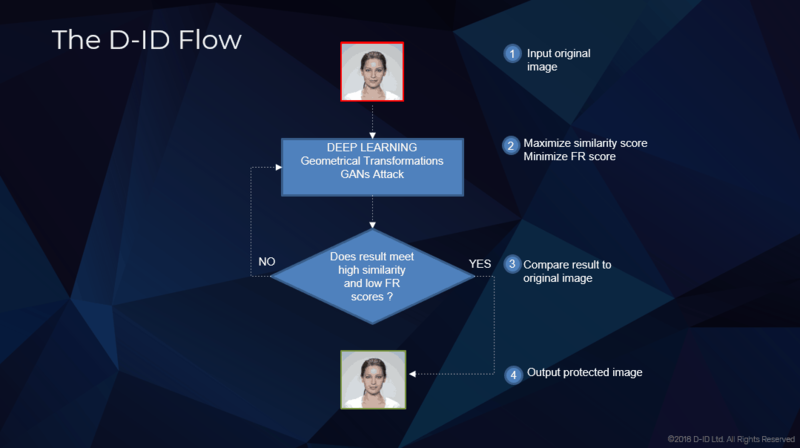 D-ID™’s groundbreaking technology, utilizes minute geometrical changes and Generated Adversarial Noise (GAN) to address cases in which Human Recognition is needed but Automated Facial Recognition is not. For the first time, with the most advanced Artificial Intelligence (AI) machine learning, these two contradicting goals are satisfied simultaneously, in a commercially available product. Using newly developed human similarity models, the AI modifies facial images keeping a high similarity score for humans. At the same time, the computerized Facial Recognition score is minimized, resisting publicly available Face Recognition Systems (FRS). This is illustrated below in Figure 1.